Oahu, known as "the Gathering Place," is the island most often visited by travelers to Hawaii—and rightfully so. From scenic beaches to interesting museums and moving historical monuments, there are so many things to do on Oahu that you'll never be able to do them all in just one visit. Here, we've chosen our 17 top things to do on the island of Oahu, Hawaii. Oahu offers some great luaus. Germaine's Luau is held on a private beach on Barber's Point east of Honolulu, and another popular option is the Paradise Cove Luau, held on a 12-acre beach at the Ko Olina Resort. It features great food, Polynesian entertainment, traditional Hawaiian games, and lessons in lei making. Other great options inlcude the Polynesian Cultural Center's Ali'i Luau, held in La'ie on Oahu's North Shore, and the Hilton Hawaiian Village Beach Resort & Spa's Waikiki Starlight Luau. Located in the heart of Honolulu you'll find many of Hawaii's most historic buildings including the 'Iolani Palace, home to Hawaii's last monarchs. It is the only royal palace on U.S. soil. You'll also want to visit the Hawaii State Capitol, the Kamehameha I Statue, Kawaiaha'o Church (the first Christian church in Hawaii), the Mission Houses Museum, and the Old Federal Building. All of historic Honolulu is within an easy walking distance of downtown parking at the equally famous Aloha Tower. Known as the "surfing capital of the world," Oahu's North Shore spans from La'ie to Ka'ena Point. Still, it's an area that far too many visitors never take the opportunity to see. An easy hour-long drive from Waikiki will bring you to lovely Haleiwa town where the North Shore begins. From there you can drive in an eastward direction around the North Shore. Oahu's North Shore is home to the top world-class surfers in the world when the winter waves reach their majestic heights. Be sure to stop at the Banzai Pipeline where you can see surfers make their way through the middle of a wave. Other North Shore places to visit include Kahuku with its shrimp trucks, Turtle Bay, Waimea Valley, Waialua, Mokule'ia and Kaena. The Bishop Museum is recognized as the State Museum of Natural and Cultural History. While the name of the museum is officially the Bernice Pauahi Bishop Museum, the museum was established by her husband Charles Bishop to whom Bernice had left her personal property upon her death in 1885, fulfilling their dream of preserving Hawaii's cultural heritage. Bishop Museum is the largest museum in the state of Hawaii and the premier natural and cultural history institution in the Pacific. The museum houses the world's most extensive collection of Polynesian cultural and scientific artifacts. Throughout its history, the museum's commitment has been the gathering and the dissemination of information on Hawaii and the Pacific. One of Oahu's most rewarding hikes is the 2.5-mile round trip hike to Makapu'u Point, the most eastern point of Oahu. The hike to the point is mostly uphill and takes about an hour each way. If you take the hike, do it early in the day when the sun will be behind the cliff face as you climb. The views of Waimanalo Bay to the north and Sandy Beach and Koko Head to the southwest are spectacular. It is also an excellent spot for whale watching from December through May. Pearl Harbor and the USS Arizona Memorial remain top tourist destinations in Hawaii with over 1,500,000 visitors annually. A visit to the USS Arizona Memorial is a solemn and sobering experience, even for those who were not alive when the attack occurred. You are standing over a grave site where 1,177 men lost their lives. The USS Bowfin Submarine Museum & Park at Pearl Harbor offers visitors the chance to tour the World War II submarine USS Bowfin and view submarine-related artifacts on the grounds and within the Museum. The USS Missouri or Mighty Mo, as she is often called, is anchored at Ford Island in Pearl Harbor within a ship's length of the USS Arizona Memorial, forming fitting bookends to the involvement of the United States in World War II. Diamond Head looms large over the Waikiki. Named Le'ahi by Hawaiians, it received its more well-known name in the late 1700s when British seamen saw calcite crystals sparkling in the sunshine and thought they had found diamonds. A hike to the top of Diamond Head takes about an hour over a well-worn path. The trail up, for the most part, is not too steep. There are handrails along the entire 1.4-mile round-trip journey. There are also benches to sit on if you want a break. It's also a popular route with trail runners. The summit offers a spectacular 365-degree view of Oahu and is a must-visit for photography enthusiasts. Waikiki is a great place to shop and offers such prestigious retailers as Tiffany & Co., Chanel, Gucci and Saint Laurent, as well as more modest stores, such as the ever-present ABC Stores and the world-famous International Market Place. The Royal Hawaiian Center has undergone a major renovation and contains 150 stores and restaurants on four levels. New in recent years, Waikiki Beach Walk, has a number of excellent shops and restaurants on its two open-air levels, while the DFS Galleria the only place for foreign guests in Hawaii to enjoy duty-free savings on the world's leading luxury brands. The best place in Hawaii to learn about the culture and people of Polynesia is at the Polynesian Cultural Center (PCC) in Laie, the gateway to Oahu's North Shore. The Center has been Hawaii's top paid visitor attraction for over 35 years. The PCC features seven Polynesian "islands" in a beautifully landscaped 42-acre setting. Young men and women share the arts, crafts, and culture of their homelands with visitors. The Center's Rainbows of Paradise Canoe Pageant show is performed daily on the main lagoon. The PCC is also home to Hawaii's first and only IMAX™ Theater. The Center's evening Ali'i Luau is followed by their new spectacular 90-minute evening show, Ha: Breath of Life. Located in Kapi'olani Park on the east end of Waikiki, the Honolulu Zoo is the largest zoo within a radius of 2,300 miles. It is too often overlooked by visitors. The Honolulu Zoo is ever changing and modernizing. Beginning in the 1990s, numerous exhibits were redesigned to feature more natural settings for the animals on display. That work continues today. Located nearby at the shoreline, the Waikiki Aquarium offers exhibits, programs, and research focus on the aquatic life of Hawaii and the tropical Pacific. Over 3,000 organisms are on exhibit representing more than 500 species of aquatic animals and plants. The aquarium is located next to a living reef on the Waikiki shoreline. Hawaii Food Tours was born to help people find some of the great places to eat in the Honolulu area. Together with his partner and wife, Keira Nagai, Matthew Gray (an accomplished chef and former food critic for the Honolulu Advertiser), will take you on one of the most fun adventures you've had on any vacation. Their most popular tour is their "Hole-in-the-Wall Tour," which is offered daily from 10 a.m. to 2 p.m. On this your, you'll visit several mouth-watering local, ethnic, and exotic restaurants and marketplaces, primarily in Honolulu's Chinatown, and two of Hawaii's most famous bakeries. Spend an evening at a Las Vegas type show seems odd for a trip to Hawaii, but it's worth it. Legends in Concert Waikiki's "Rock-A-Hula" show runs nightly Tuesdays through Sundays at the Royal Hawaiian Theater on the top floor of the Royal Hawaiian Center in Waikiki. While the show has great segments with artists portraying several big stars, the star of this show is Elvis Presley. There's no surprise that the Waikiki show centers around the artist who has become such an integral part of Hawaii and remains so even now 35 years after his death. You'll hear all of the songs made famous in one of the Elvis movies filmed in Hawaii or performed in his historic 1973 Aloha From Hawaii concert that was beamed across the world to record audiences. As is the case with all of the Hawaiian Islands, there are many areas of Oahu that can only be viewed from the air. Even places that you're used to seeing from the ground gain a whole new perspective when viewed from above. From a helicopter, you'll be able to see the oil slick that still gently flows from the hull of the sunken USS Arizona, and you'll be able to appreciate the beauty of the sandbars off of Kaneohe on Oahu's eastern shore. Paradise Helicopters flies out of the Turtle Bay Resort on Oahu's North Shore, while Makani Kai Helicopters flies out of the Honolulu International Airport and the Ko Olina Resort and offers free roundtrip transportation from Waikiki. Kualoa Ranch on the Windward side of Oahu is a working cattle ranch whose owners have dedicated themselves to keep the ranch, including its two majestic valleys and large fish pond free of commercial development and in as natural a state as possible. To accomplish this goal, the ranch has developed a number of activities and tours which have become more and more popular every year. These include a Hawaiian Experience tour, Movie Site & Ranch tour, Jungle Expedition, Fishpond & Garden tour as well as ATV tours and horseback rides. With the increased development of the nearby Ko Olina Resort, highlighted by the opening of the Disney Aulani Resort, more visitors are choosing to explore the Leeward Coast since it is closer to their accommodations than most other areas of the island. The Leeward Coast is a beautiful part of Oahu with quite a different geography than you'll see elsewhere. 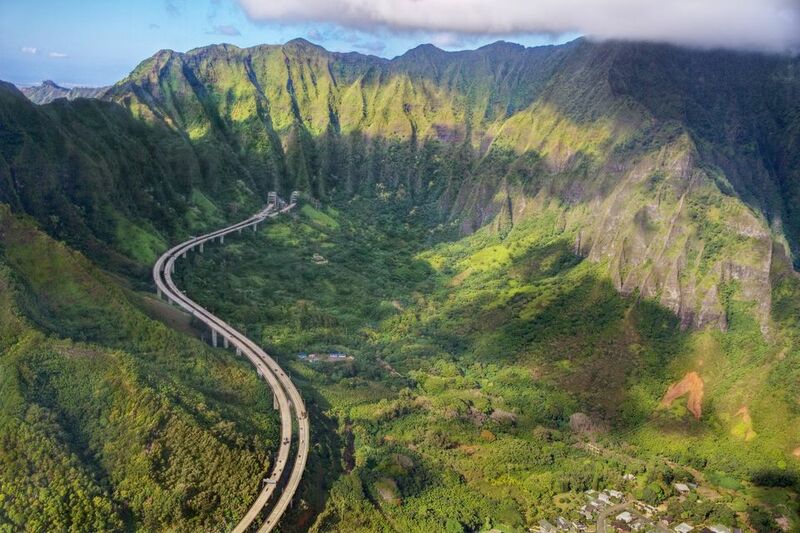 There are strikingly beautiful valleys such as Makua and awe-inspiring coastlines such as you'll find at the end of the road at Yokohama Beach and Kaena Point. Along the coast, there are some great hidden wonders such as the Kane'aki Heiau in Makaha Valley. Located just a short drive from Waikiki on the other side of the H1 Freeway is the Manoa Valley. Primarily a residential area, the valley has some great places to visit. It's a perfect day trip for visitors staying in Honolulu and Waikiki who don't want to have to spend most of the day driving. Within the valley, you'll find the University of Hawaii's main campus. The campus itself is quite lovely, but one of the highlights is the University of Hawaii bookstore. The University of Hawaii Press publishes some of the best books on Asia, Asian Americans, Hawaii, and the Pacific. Between the university and the back of the valley is a highly populated residential area that you need to drive through to get to the valleys true gems, the beautiful Manoa Chinese Cemetery, the Lyon Arboretum, and the trailhead to the Manoa Valley trail which will take you to Manoa Falls. Parking is available at each of these locations. Lost, one of the most popular and talked-about TV series of the last decade, was centered on an island, presumably located somewhere in the Pacific Ocean, but flashback (and flash-forward) scenes took viewers to numerous locations on the mainland and around the world. Aside from a handful of scenes, the entire series was filmed on the island of Oahu making great use of the islands diverse geography and architecture. Need to show the Sydney Airport? Use the Hawaii Convention Center. Need to show a scene in Nigeria? Use an old sugar mill in Waialua. Can you imagine the home of a wealthy Korean businessman? Use the Byodo-In Temple near the Kaneohe/Kailua area. Remember those great scenes set hiking across the island? Visit the Ka'a'awa Valley of Kualoa Ranch. Even today, years after the show has ended, Oahu visitors love to seek out the locations where Lost was filmed.